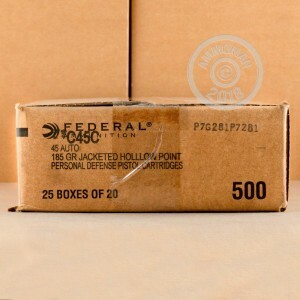 Federal's Hi-Shok brand is an old school cartridge that still packs plenty of muscle for the self-defense or handgun carry role; the design is so effective that some of the more recent personal protection brands use it as a starting point. 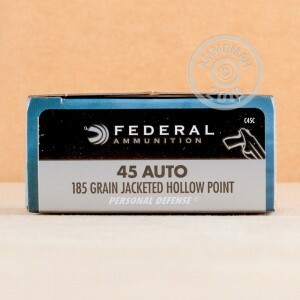 Each of these .45 Auto rounds wears a jacketed hollow point (JHP) projectile up top. The JHP has a wide-mouth cavity and perfectly placed skivings in its copper jacket which contribute to wide, pre-programmed expansion upon impact with a threat. As the bullet peels outward its trajectory will shift while its velocity slows, ensuring that all of the projectile's momentum is transferred to vital zones in order to yield a quicker end to a violent confrontation. At 185 grains, the load boasts controllable recoil and reliable function for more compact pistols. 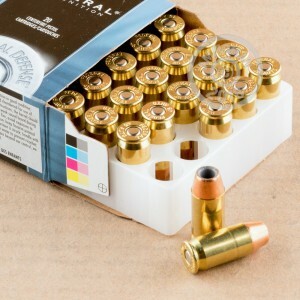 Federal crimps each bullet into a reloadable brass casing which is fitted with a non-corrosive Boxer primer at its base. The casings also have a light crimp in their midsections which support the base of the bullets in order to reduce the chance for setback to occur; this allows for more consistent accuracy while cutting the risk of setback-related malfunctions. Buying in bulk with this 500-round pack will give you plenty of .45 ACP rounds for practice, carry, and periodic magazine rotation.